A life in ministry can offer rich and meaningful opportunities to be a part of the incredible work of the Kingdom of God. It can also be a deeply challenging experience, with unexpected pressures and stresses unique to pastors and their families. 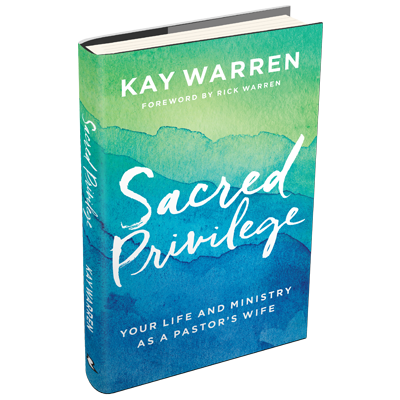 No one knows life in ministry better than Kay - mother, author, and wife of Pastor Rick Warren. As a pastor's daughter and now a pastor's wife, Kay has spent her entire life in ministry. Drawing on her experiences, she speaks honestly about the joys, tears, trials, struggles, heartaches, and triumphs of a life in ministry. 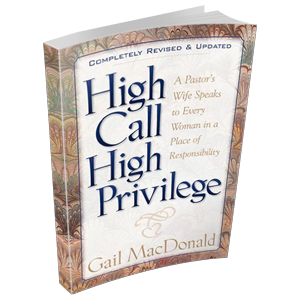 The significance and impact pastors' wives have in the Body of Christ. An inside look at the ups and downs of being a pastor's wife. Affirmation that the rewards of ministry are worth the effort, pain, and loss of privacy. Invaluable advice for living with the pressure of a public position. 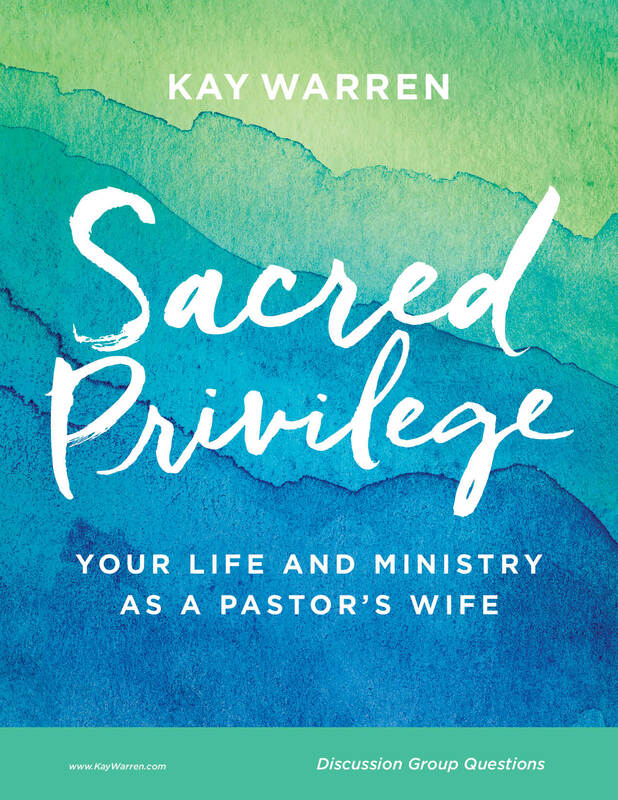 Join Kay and Beth as they discussion a great resource to help glean wisdom from Kay's new book, Sacred Privilege: Your Life and Ministry as a Pastor's Wife. The Discussion Group Questions are designed to engage you and a small group of women in meaningful conversation as you navigate the unique role of being a pastor's wife. The mission of Blessings Ranch Ministries is, "to restore and renew Christian leaders and their families for effective Kingdom service." The goal of this incredibly effective, essential ministry is and always has been emotional and spiritual inner re-enginerring and personal growth resulting in restoration and renewal of the leader. The mission of Broom Tree Ministries is to provide a gracious environment, secluded and private, protected with prayer, to which Christian leaders and their spouses can retreat from frantic schedules and become intimate with God so that He can refresh, refocus, restore, encourage, energize and equip them for the task to which He has called them. Enjoy the beautiful seascape of Coronado Island, a year-round resort area. Couples come to the cottage seeking intensive therapy for a crisis in marriage or ministry. Individuals come seeking personal renewal through multiple therapy sessions for interpersonal conflict, stress, burnout, career transitions, and spiritual direction. Cozy Bear Cabins is a group of three distinctive cabins located in The Smokey Mountain National Park area. If you like to be close to the action and excitement of Pigeon Forge and Gatlinburg, TN then Cozy Bear fits the bill. Located in a luxury resort community setting, Cozy Bear is the perfect family cabin with a mountain theme. Deer Ridge Ministries was formed to encourage pastors in full time ministry. We provide, by faith, excellent retreat facilities where pastors and spouses can rest and enjoy the presence of God without having to worry about any financial obligation. God has called us to provide a needed refuge for pastors and their spouses. We are here to provide a place of peace, refreshment and rest for body and soul at no cost to our guests! Pastors and Missionaries often need an affordable place away from the demands of their ministry where they can rest and relax. The beautiful facilities and serenity of our natural surroundings, combined with the absence of telephones, televisions or schedules makes Fairhaven the ideal place for a getaway. Individuals, couples and families can all enjoy a personal retreat at Fairhaven. Marble Retreat was born out of the conviction that clergy, and other in Christian service, have extreme job demands which can frequently result in symptoms of depression, anxiety, frustration, discouragement and burnout. Worse still and because of their position, the find it difficult to seek help. The mission of Marble Retreat is to help bring healing, hope and restoration to those in vocational Christian ministry and the Church at large through Christ-centered brief intensive counseling. The MLC is located in June Lake, California, beneath the awe-inspiring Sierra Nevada Mountain Range. In the context of an alpine, mountainous retreat environment, Christ-centered and biblically relevant principles of relationships with God, self, and others are embraced and developed through the vehicle of counseling from a spiritual formation perspective.